The first Noise Heat Power publication is now available to buy. A mix of music writing, memoir and fiction, it’s a journey through six mixtape selections that help you hear beyond the wow and flutter, and listen to the life behind the tape hiss. Back in 2010, the DJ and writer Bill Brewster – co-author of the book Last Night a DJ Saved My Life – invited me to compile a series of themed playlists and write about them for his DJ History website. The original intention was to help promote the music for sale in the site’s download store, but as I began putting the playlists together in my head, I couldn’t help but imagine them not as dragged and dropped digital files, but as notional cassettes that I might carefully construct just as I did in the long gone days of Memorex and TDK. The result was six pieces of writing that are part music journalism, part memoir – and occasionally, part fiction. 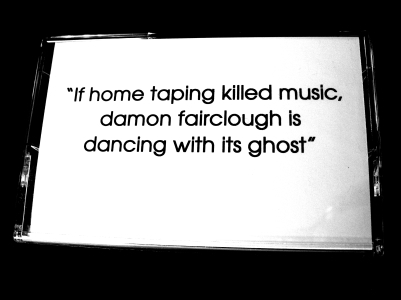 Some are devoted to a single record label, others to a remembered moment or the particularities of a time and place. Originally intended for internet publication, these articles have now been compiled into one 154-page book – perfect for a rewarding read anywhere, but particularly in places where Kindles fear to tread. Each piece is a track-by-track breakdown of a 60-minute tape compilation; the six chapters are detailed below. If you would like to buy a copy, just get in touch with me via the Contact page. “I never even liked tapes. It wasn’t necessarily that they sounded bad – after all, yesterday’s world was a place where surface noise and analogue hiss were as much a part of music as the instruments that were integral to its creation. It was more that the fragility of that tightly-wound plastic strip always seemed to threaten the music held within, and while actual cassette malfunctions were rare, the prospect of a snap and a tangle and a jammed up machine made me permanently apprehensive about using the popular, pocket-sized format. 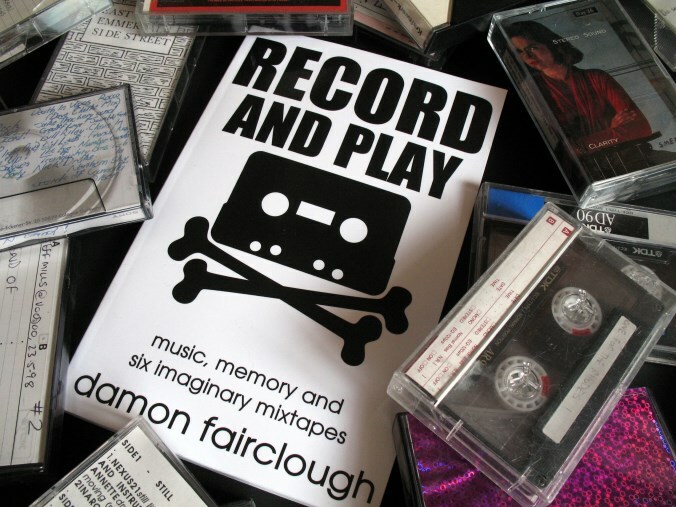 I realise these are strange words with which to open a book about the magic of mixtapes, and I apologise for my perversity in this matter; the tales that follow are actually more about music and life and the bits in between than a celebration – or otherwise – of a format. But even as I spurn the lure of the rotating spool and the Letrasetting of another custom inlay, it seems that the long lost art of fitting in just one more tune before the machine slams to a stop lives long in the memory. Tracklist features The Mighty Wah!, The Fall, Winston Jarrett, Scritti Politti, Young Marble Giants, Eek-A-Mouse, Cocteau Twins, Jamie Principle, Black Uhuru, Liquid Liquid, Bauhaus, Nico. From nine to five, from cradle to grave – a mixtape for workers everywhere. Tracklist features Mr Len & The Juggaknots, Alan Hawkshaw, Chicago Music Syndrome, Brandt Brauer Frick, Junior Delahaye, The Happy Family, Ringo, Dennis Bovell, This Mortal Coil, LFO, Robert Wyatt. There’s nothing like a chill-out mixtape – and this is nothing like one. Tracklist features Santa Dog, ARP, Syclops, Lush, MFSB, Capitol K, Sun Ra, DJ Bootsie, Tune-Yards, Theo Parrish, Trembling Bells. Into the dark heart of childhood with the library music of the KPM 1000 Series. Tracklist features Alan Parker & Alan Hawkshaw, Bill Le Sage, Tony Kinsey, Syd Dale, David Lindup, Keith Mansfield, Dave Gold, Harper Russe St George, James Clarke, Marian McPartland. A mixtape tribute to the London record shop and label, Honest Jon’s. Tracklist features Wareika Hill Sounds, Tshetsha Boys, Le Volume Courbe, Tony Allen, Hypnotic Brass Ensemble, Rick Tomlinson, Actress, Moritz von Oswald Trio, Elmore Judd, Kokanko Sata, Selah Collins. A mixtape journey into the sci-fi future/past of Yorkshire music. Tracklist features The Cult, Human League, Cabaret Voltaire, The Mission, Gang of Four, Red Lorry Yellow Lorry, Heaven 17, Age of Chance, Stephen Mallinder, Be Bop Deluxe. To buy Record and Play, just drop me a line via the Contact page.